The 2nd Annual Tour De Ile Bicycle Ride put on by the Rotary Club of Grosse Ile is this Sunday, September 25, 2016. Trinity Transportation is proud to be a continuing sponsor for the Tour de Ile bicycle ride. Riders can choose from 19-mile, 33-mile, or 52-mile course. All routes have a recommended start and stop time that begin and end at the Airport Hangar in Grosse Ile. 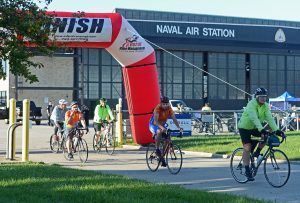 Rider registration will be located inside the Naval Air Station Hangar along with breakfast, lunch, after party, clothing purchases, sponsor displays, prizes, and pre-registered rider packet pickup. Registration begins at 7 a.m. and the course opens at 8 a.m.
Keep in mind the Tour de Ile is not a race but a bicycle tour. Time is not being recorded. There will be 14 stops along the tour. All courses will close at 1 p.m. and lunch will be served at the Grosse Ile Airport Hangar from 11 a.m. until 2:00 pm. Your bid number will be your lunch ticket.